According to the new research made by the Royal Opera House, UK, audiences for opera and ballet at the Royal Opera House are far younger and less affluent than previously perceived. In contrast to the elitist image often portrayed, the research reveals a far greater diversity in age, income levels and lifestyles. These trend seems to be spreading worldwide. 1. Ballet seems to be targeted lately for a younger public. I love this new trend. Here you can appreciate Hozier's "Take Me To Church" track coupled with this expressive dance piece by the Ukrainian ballet dancer Sergei Polunin. Do you like this performance? 2. Till a few years ago it seemed that ballet was oriented to an elite group. Now it seems to be working on becoming popular. Have you ever been to a ballet performance? 3. 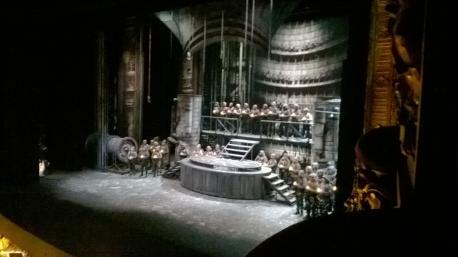 A few days ago I took my daughter to see Wagner´s opera: Parsifal in the Colon Theater in Buenos Aires, Argentina. It´s a very unique theater with one of the best acoustics worldwide. Despite most of the public was 65 and over, there was a new, younger group ready to enjoy the show. A few of them clearly belonged to the Argentinian high society. The others were students who struggled to pay the fee to get there. They all seemed to be pleased. We spent 5 hours there and both of us could have stayed longer if needed. It was wonderful. Have you ever been to the opera? Nearly 30%of those going to the ballet and 37% of those going to the opera at the opera house are typically students and young professionals. Around a fifth of opera goers are under 35 years of age and 42 percent are under 45 years of age. Most of the traditional opera houses are working on educating a new generation to appreciate opera and ballet.